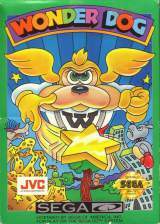 Sega CD published 27 years ago by JVC Musical Industries, Inc.
Wonder Dog © 1992 JVC Musical Industries, Incorporated. North American release. Game developed in Japan. See the original for more information.